A forest may look peaceful, but it’s a rough world out there. Imagine having to stay rooted in one spot your whole life. How do plants survive variations in temperature and precipitation, destructive storms, extreme topography , plant-eating animals (from insects to deer), and the competition from other plants for the same patch of soil and sun? How do plants' complementary characteristics make them ideal candidates for living in community? Different plants have characteristics that help them survive and thrive in different conditions. It would be highly unusual to find a plant that thrives in both a desert and a cool rainforest, because all plants have a limited range of environments in which they thrive. As you might expect, plants that can survive in similar conditions tend to be found living together in natural communities . For example, regular flooding in flood-prone places tends to weed out all but the flood-tolerant plants. Plants with different but complementary needs also naturally cluster together—for example, in a forest, tall trees that thrive in direct sun provide a shady habitat for plants that would be scorched by too much sun. Suites of plants that can be found growing together again and again across the landscape have formed these natural communities because their unique blend of characteristics makes it possible for each of them to survive and maybe even thrive in that physical setting. Explore some common survival characteristics of plants below, keeping in mind that the widely diverse characteristics in plants make them valuable building blocks for natural communities. Skunk-cabbage (Symplocarpus foetidus) in Red Maple Seepage Swamp in spring. Other plants are generalists, able to grow in diverse habitats (up to a limit). Red maple, for instance, can grow in a wide variety of forested habitats. The trees that tower in a forest get the most sun, but are more exposed to wind, lightning, and snow and ice. Lower growing plants make do with dappled sunlight, but are protected from some of the elements by the taller trees. They also don’t need to expend as much energy or as many resources reaching the highest heights. Tall, mature trees, such as oaks and tuliptrees, form the highest layer of the forest—the tree canopy . Smaller trees, like flowering dogwood and young specimens of large trees, grow underneath the canopy in the tree understory (also called the subcanopy ). Beneath those trees, you’ll find the shrub layer, made up of shrubs, saplings , and vines. The low plants on the forest floor—wildflowers, ferns, and tree seedlings—are referred to as the field layer on this website. Deciduous plants shed all their leaves in each year in autumn. Tuliptrees, flowering dogwood, and hydrangea bushes are deciduous. Being leafless in winter reduces moisture loss and damage from plant-eating animals or freezing temperatures, but deciduous plants give up winter-time photosynthesis and must expend a lot of energy in spring to make a whole plant’s worth of leaves at one time. Evergreen trees and shrubs are those that are green year-round. Old leaves die and new leaves grow, but the old leaves are not shed all at once, so that the plant is never completely leafless. Evergreen leaves may be needle-like, such as pine needles, or broad, such as the leaves of southern magnolia, American holly, or mountain laurel. During winter storms, the weight of snow or ice on the leaves of evergreen trees can cause the limbs and treetops to break if they are not flexible enough to bend under the weight. For this and other reasons, in latitudes or elevations where freezing precipitation frequently occurs, natural forests more commonly contain winter storm survivors, including leafless deciduous trees, and evergreen trees with needle-like leaves and/or pliable limbs. Some wildflowers need direct sunlight only in early spring in order to flower—they bloom before trees leaf out, then spend the rest of the summer in dappled shade. These often showy wildflowers are called spring ephemerals because they make a brief appearance in the spring, and are inconspicuous (or, in some cases, dormant below ground) during other seasons. Dutchman’s breeches, mayapple, yellow trout-lily, Virginia springbeauty, cutleaf toothwort, bloodroot, and Virginia bluebells are just a few examples. Still other plants, like most grasses and meadow species, require fairly direct sunlight all their lives to thrive. Plants that tolerate direct sunlight and germinate quickly from seed often are the first colonizers of disturbed land sites—places recently cleared or burned, for instance. They help prevent erosion. 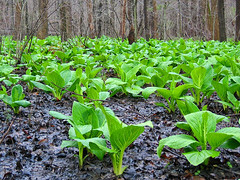 Others, like skunk-cabbage, have no problem growing in wet soil . A floodplain, however, comes with more challenges for plants than just soggy soil. But it also includes some perks. Ecobit: Rich But Hard to Live With Even so, lots of plants are adapted to flooding—like American sycamore, green ash, or American water-willow. Many plants do best in conditions that are fairly moist, but not soggy or prone to flooding. Ecologists use the word mesic to describe this well-drained and not-too-wet, not-too-dry condition. In nature, lightning occasionally starts forest fires. Humans also start forest fires, by accident or on purpose. Fire can be either an enemy or a friend to plants. Many species of plants will die when scorched with fire. Some species, however, are well-suited to handle certain amounts of fire, and others actually do best with occasional fires. Mature chestnut oak has thick bark that protects it from most fires. Mountain laurel can burn to the ground yet sprout right back up from the roots. Pitch pine, unlike most other pine species, can sprout back from unburned portions of its trunk if scorched by fire, and some of that species’ pine cones actually require fire to release their seeds. 2. Burns RM, Honkala B.H.-tech-coords.. 1990. Silvics of North America: 1. Conifers; 2. Hardwoods. Agriculture Handbook 654. vol.2, 877 p.